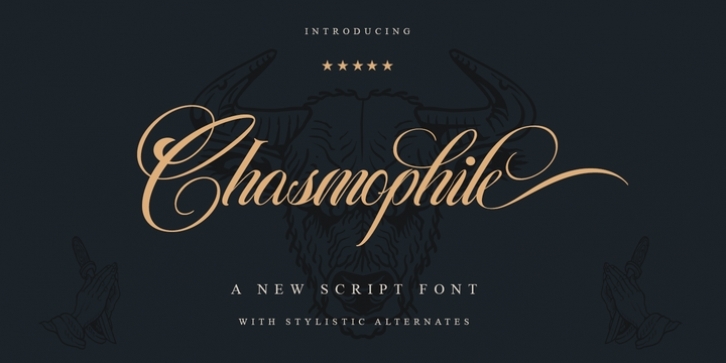 Chasmophile is a beautifully classic script. It has cleanly looping ascenders and descenders as well as elegant uppercase forms. Classic, yet free spirited, it is a typeface for a wide variety of use it is very soft and has fast curves, while its low slant angle makes it very legible. It works perfectly for creative projects such as logos, T-shirts / apparel, badges, invitation, packaging, headlines, posters, magazines, greeting cards, and wedding invitations. You can access the OpenType features on mostly Adobe programs, such as Adobe Indesign, Adobe Illustrator, Adobe Photoshop. etc.